Welcome to Earthshield Foam Insulation - Mandeville, Louisiana's preferred installer of open or closed cell foam for rooflines, walls and floors. If you're in Mandeville, Slidell, Covington, Madisonville, New Orleans, Metairie, Lacombe, Hammond, ( all of Louisiana) and Picayune, MS, and are looking for top-notch residential or commercial insulation experts you can trust, you couldn't have come to a better place! Earthshield Foam Insulation is the premier provider of energy saving solutions insulation on open or closed cell, which are much better alternatives to conventional insulation products. We provide professional foam insulation installation for both residential and commercial clients. We install insulation for new and older structures in parts like the attic, interior walls, exterior walls, underneath the floor of your raised house, and others. Whether you prefer open cell foam insulation which is more flexible, easier to apply, and is more affordable to have installed in your home or business, or closed cell foam insulation which is denser, more rigid, and offers better protection, just give us a call and we'll be more than happy to help guide you make the right choice! 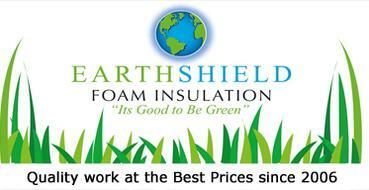 You may reach us by phone at 985 789 8851 or 985 624 8415 or via email atearthshieldfoam@yahoo.com. We're open from Mondays thru Saturdays, 8:00 AM to 4:00 PM.